Portland Massage Discount: $20 off! 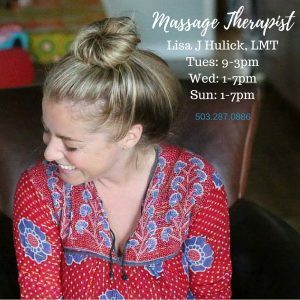 Living and practicing in New York City since 2003, Lisa Hulick has now returned to her second home of Portland to continue offering massage and doula services in Portland. Click here to schedule your first massage with Lisa Hulick at Blossom Clinic and get $20 off! She began practicing massage in 1999 after completing her training at the Oregon School of Massage while finishing her undergraduate studies at Lewis and Clark College. In 2003, she moved back to NYC to be close to her family, help care for her newest nephew and attend the Institute for Integrative Nutrition. In 2005, she spent 6 months in Pune, India apprenticing with an Ayurvedic doctor, learning traditional therapeutic massage. Upon her return, she completed a 300-hour yoga teacher training with Kelly Morris and several years of Tibetan Buddhist studies with the Yoga Studies Institute, going on to teach yoga, meditation and Buddhist philosophy in some of the most beautiful and respected yoga studios in NYC and Brooklyn. She completed prenatal teacher trainings through Ma Yoga and PURE and went on to create her own prenatal teacher training program for the Conquering Lion Yoga Teacher Training. In 2013, she Founded MOM by LJ, a boutique doula practice providing pregnancy, labor, childbirth and postpartum care, combining her passion for prenatal care, yoga, massage and nutrition. She is known for her caring, grounded touch and support and is thrilled to be joining the team at Blossom.